Better than that, I celebrated my 80th birthday in December. I’m grateful I’ve survived, even thrived, till now. After my mastectomy and chemotherapy in 1979 my chance of cancer recurrence was high. But I prayed a lot, tried to live as well as I could, and became braver than I’d been. And if my living long and well happens to annoy anyone who has treated me badly, that’s a plus — though I never needed revenge. A lot of water has flowed over the dam and under the bridge since August when I posted my Long Island Railroad gap mishap, but I’ve been too preoccupied to tell about it all. Honey and I moved to Maryland in September and are very glad we landed here. We’ve gathered more material for “The Perils” getting settled, but came through safely. I’m ready to write again — at least monthly if I keep a resolution. It’s January 2012, but I’m not wishing you a Happy New Year. I wish you a loving heart, an open mind and a hopeful spirit. Also a good friend or two, a sense of humor, a pet who owns you, and an occasional or even daily glass of wine — if you can enjoy that pleasure. Happy will come. 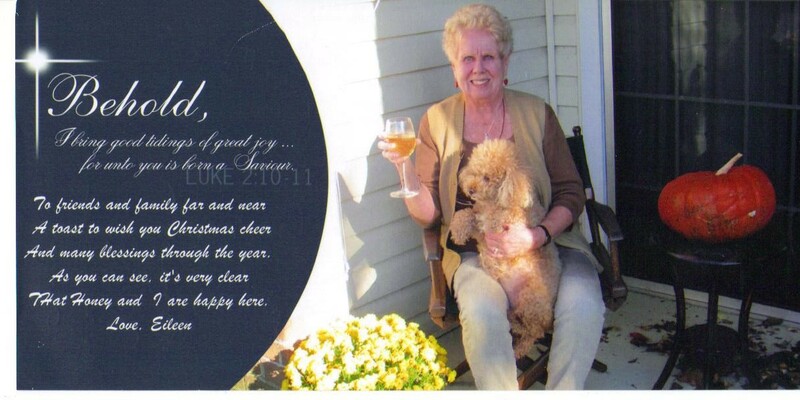 See my 2012 Christmas card above.